Playing music and following a dream seem to be synonymous, but that dream is not exactly the same for those chasing it. Some people see that dream as playing hit singles for thousands of people, fame and fortune. But there is a small minority that believes in something very different. Maybe the dream is in the chase. That dream is in the struggles and the happiness that comes along with making music with your best friends. Burning Streets has been celebrating this idea since they first began in 2008. With their first release "Is it in Black and White?" (Sailors Grave 2009) they immediately began the chase. In an old GMC, they managed a few full U.S. Tours, multiple East Coast and Canadian tours as well as the band's first journey over seas to Europe in late 2010. While that all seems like it has made them who they are, Burning Streets is more confident that this new era will bring about their most defining moments. They ventured into the studio early this year to record their second record. 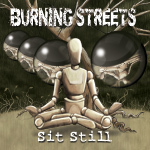 Inspired by the constant inconsistencies that they have encountered over the years, they felt it appropriate to title this release "Sit Still." 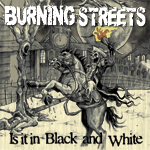 While supporting a more mature and experienced Burning Streets, the record has also been produced by Marc Cannatta (ex-Far From Finished). They are hopeful that this release will turn the heads of people who have heard the first, and more so, open the eyes of people who have not. It is sure to be a very serious look into the personality of Burning Streets, as well as a reminder of what punk rock is really all about. Recognizing the hard work that was put into this release, Burning Streets plans on keeping the gas pedal pressed when it comes to touring. They are songs that they want people to hear and feel. The first journey will began in late August as they hit the road for a full U.S. Tour, this is sure to be followed by the east coast and Canada, and then of course, Europe. Then who knows? Maybe this era really will bring about new and exciting things for the foursome. The band is ready for "Sit Still," confident and hoping that all the moments and memories attached to it will not disappoint.